Safdarjung is a very popular name in Delhi. There is a hospital and an airport after the name besides the tomb which is perhaps where the name came in the present consciousness. Safdarjung was the Nawab of Oudh (Awadh) – the present east U.P. When the Mughal power began to decline after Aurangzeb’s death, Safdarjung began to increase his influence, ultimately becoming the chief minister of India and a virtual ruler, the ineffective king being just a puppet in his hand. Soon the power got to his head and he fell out of favor. When he died, Safdarjung’s son asked permission to build his tomb in the ‘waste lands’ south-west of Shahjanabad (the present Old Delhi). Today the waste land is one of the poshest areas of Delhi. 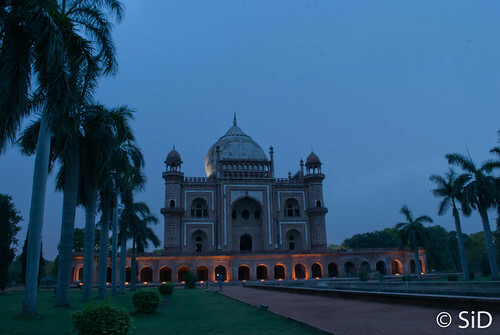 When you see the Safdarjung’s tomb it looks similar to a person with a small body and huge head. Inspired by the Humayun’s tomb, Taj Mahal and Mughal architecture in general, this tomb is one of the last buildings to be built in the 300 year long Mughal period. Marble was in short supply as the now weakened Mughal dynasty did not control the quarries near Agra, so marble was used from other buildings in the vicinity. Obviously it was not enough as it is clear if you closely look at the patchy work. But the walls, ceilings and pillars, all are intricately and lavishly done. It could easily have been a palace had a marble tombstone not been there at the center of it. The only drawback being the present guards of this palace who were on the wrong side of the rudeness scale. I just love your short posts on Delhi and its vicinity…Though I was always curious to know about these things, somehow cud n’t get time or chance to know more about them..so be it your posts on Tughlakabad, Kashmiri Gate, Humayun’s tomb, Lodhi gardens, i just enjoy reading them ! And with your new cam, its even more fantabulous ! Carry on the good work paaji ! I read that Safdarjung was considered an able administrator. But he died at the age of only 46 years. I don’t know why.